A childhood favorite street food of Tutubi, long planned to be blogged but not quite til now, is this obnoxious smelling yet delightfully satisfying bibingka recipe variant of Laguna where duck eggs are mixed with abnoy (spoiled eggs) and cooked in clay pots lined with banana leaves where it emits an obnoxious aroma. 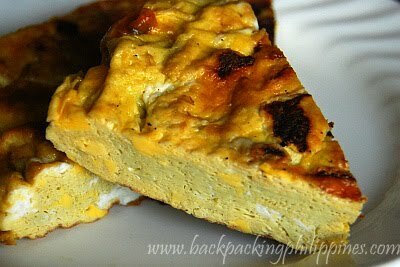 One memorable event Tutubi regarding this Laguna delicacy is in Lingga, Pila where his friends cooked them for their group who found the smell too much to endure yet devoured the bibingka itlog in seconds right after they were served. 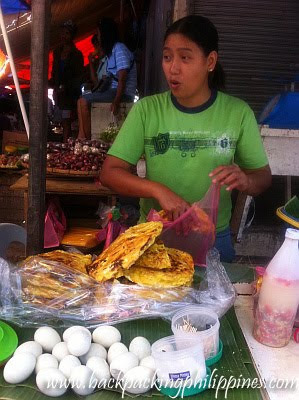 Bibingkang Itlog is best served with spicy vinegar and to make it authentic street food, sold on banana leaves, and eaten with toothpicks (as shown on the top picture). 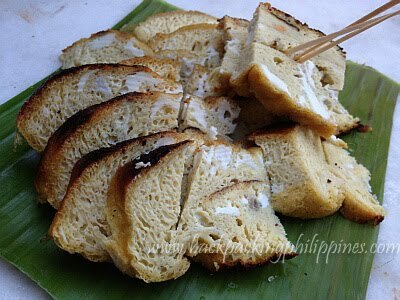 Bibingkang itlog though, like other exotic food, requires an acquired taste to enjoy it otherwise it's like a Fear Factor challenge. This is easier to ingest though than the more exotic and challenging bibingkang abnoy of Pateros, made wholly from abnoy (bugok na itlog ng itik) but fried (like torta) then dipped in spicy vinegar. It is not unhealthy to consume rotten eggs? Wow! I miss abnoy, paborito ko! Mas gusto ko yung mas mabantot na version kesa sa less smelly. I miss this!! Im craving for this right now! If anyone knows where I can buy it here in SoCal.. please let me know.